The event is free and open to the public, and will take place from 6-8:30 p.m. in the Robinson Teaching Theatre in Weyerhaeuser Hall at Whitworth University. For more information, please call 509.777.3228. 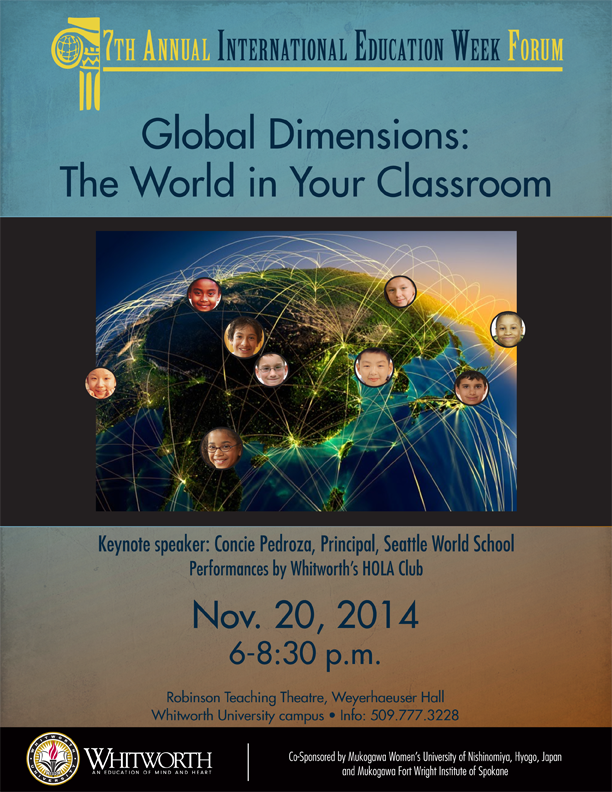 Seattle World School comprises 300 students who speak up to 40 languages. The school focuses on supporting English language learners of all levels and providing a unique global learning experience. Pedroza began her career in education as a bilingual orientation teacher at Thurgood Marshall Elementary School, in Seattle, and has since served as the principal for both Orca K-8, in Seattle, and Jefferson Elementary, in Everett Public Schools. Not only does Pedroza possess valuable experience working with the global dimension on an educational level, she also has firsthand experience as the daughter of migrant workers from Mexico and Texas and understands the challenges faced by children of a socio-economic, cultural or linguistic minority. In addition to the annual forum, this week is Cultural Awareness Week at Whitworth, which will conclude with the International Festival dinner and entertainment on Friday, Nov. 21, at 5 p.m. in the Hixson Union Building Dining Hall. Students with meal plans are free. General admission is $10. Tickets can be purchased at the HUB Info Desk.